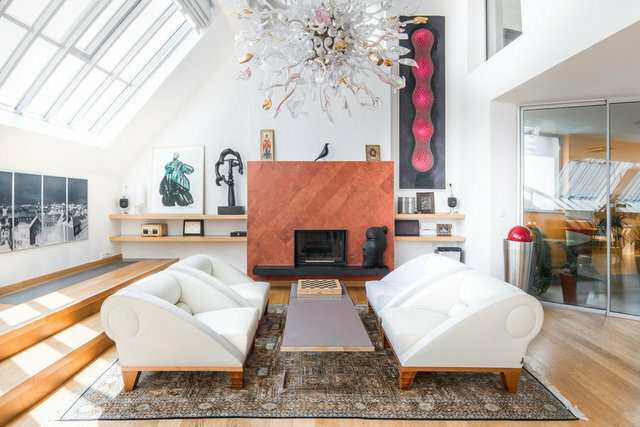 The design penthouse with a floor area of 421 sqm is situated on the 5th and 6th floors of a late-19th century house in the lucrative New Town city quarter of Prague. The penthouse includes a 49 sqm roof terrace offering a 360° panoramic vista of the city, underground parking for 3 cars and a wine cellar. The 7-room apartment layout is logical, practical and comfortable. The Art Deco style provides casual elegance to the originally designed space. The main downstairs lounge room offers a living area with a fireplace and a dining area with a kitchen equipped with a marble work top and Miele appliances. The downstairs area further offers 2 bedrooms, a winter garden with a closed balcony, a bathroom, a toilet for guests and a spacious cloakroom. The glazed upstairs floor of the gallery will take you to the bedroom with access to the terrace, which offers a breathtaking panoramic vista of the city including Prague Castle, the National Theatre and Petřín hill. The interior style is characterised by a combination of clean simple lines with original elements reflected by the luxury Italian Minotti furniture with added paintings and sculptures by well-known artists. This exclusive apartment is fit out with top-quality equipment, including several artistic gemstones. This includes, for example, bronze pumas by the famous sculptor Michal Gabriel and further works of art by famous Czech designer Bořek Šípek. The equipment meets the highest requirements: oak floors, large tiles, BANG & OLUFSEN sound system in all rooms and the smart household management system. The large roof windows provide sufficient daylight to the apartment and are equipped with remote control blinds. The self-regulating system of the apartment will, for example, close the windows in the rain to protect the interior against external effects.